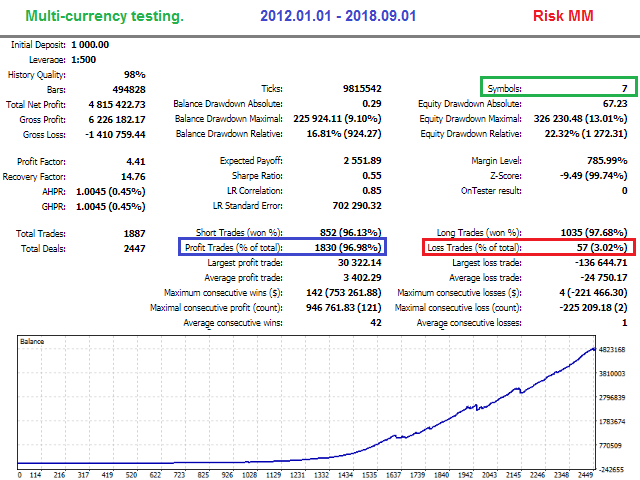 The trading system operates on seven pairs and one timeframe. The Expert Advisor uses trading systems for trend-based entries with the help of the Envelopes and CCI indicators. Each indicator uses up to five periods for calculating the trends. The EA uses economic news to calculate the prolonged price movements. The EA has the built-in smart adaptive profit taking filter. The robot has been optimized for each currency and timeframe simultaneously. For the EA operation, open "Tools" > "Options" > "Expert Advisors". Check the option "Allow WebRequests for listed URL:". Add https://ec.forexprostools.com, https://time.is/UTC and click OK.
For the strategy tester: the EA provides integrated data on economic news from 2008.01.01 to 2018.12.02. 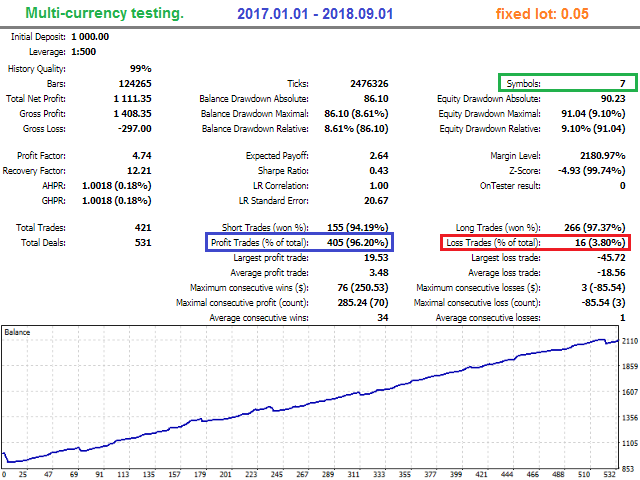 Control points (nearest less timeframe) or Open prices only (quick method on complete bars). It is recommended to install the EA on one chart, you can enable and disable currencies in the settings. The minimum recommended balance for the EA's use with the recommended pairs and timeframes - $1000 or $10 on a cent account. Magic_Start - ID of EA's trades. Magic_Finish - ID of EA's trades. Use_Risk_StopLoss - The risk-based stop loss. Custom_balance - FreeMargin = false or Balance = true. Percentage Risk — interest risk based on stop loss. Style/width_Lines - style/width of lines. Every_Day_End - operation end time (hh:mm). Disable_in_Friday - operation end time on Friday (hh:mm). In backtest well. We wait for real operations. 23 feb 19: Bad EA only loss!! 13 feb 19: Only few orders, and different from signal published by the author, on ICM account!! What I have to check for correct installation and set files? Improved strategy for some pairs. Fixed a small error with closing a position on one of the pairs. Added options to change Magic. Fixed a bug in the info panel. All currencies have been Optimized, now orders will be opened frequently. 1. All strategies have been updated and several new strategies have been added. 2. For strategy tester: the EA has built-in economic news data from 2012.01.01-2018.09.01.